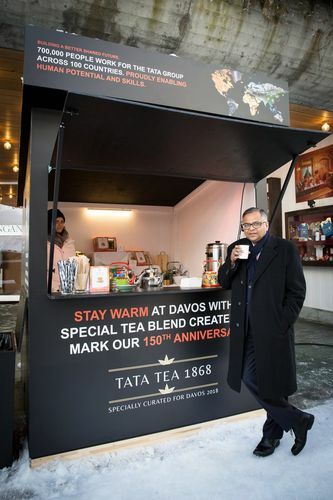 Matter of pride: Tata Sons chairman N. Chandrasekaran drinking the special tea blend created for Tata’s 150 years at Davos. A key reason for this, he says, is that the group has lived in harmony with the community. “It has given back to the community that it has lived in and served,” he says. According to him, the brand’s legacy has been built on two strong pillars—the community, which is not only a stakeholder in the business but also the very purpose of its existence; and the structure of the group, which ensures that 66 per cent of the equity of the parent company, Tata Sons, is held by the charitable Tata Trusts. Bhat’s role is to ensure that the brand continues to expand on these two pillars. He undertakes various initiatives to connect with key stakeholders in order to mark events, so that everyone is reminded of the proud heritage and history of the Tata brand. He also ensures that the brand speaks a common language across all companies. Connecting with younger stakeholders is an important aspect of maintaining the brand. Tata undertakes many initiatives to bond with them. Tata Building India School Essay Competition, for instance, reaches some 9,000 schools and four million schoolchildren; the Tata Crucible quiz is India’s biggest corporate quiz; the Tata Social Entrepreneurship Challenge, which is done in collaboration with IIM Calcutta, funds social entrepreneurs; then there are sporting events like the Tata Mumbai Marathon. “As a brand, we should be very proud of our heritage, and given that we have seven lakh employees worldwide and many stakeholders, it is important to be forward-looking while being rooted in its history,” says Bhat. He puts in place the guidelines for the brand logo’s usage, or the way ads, products or retail stores should reflect the brand. A special edition Titan watch. Tata Group’s contributions to the community are not limited to health care, education and sports. Sanwad, Tata Steel’s yearly tribal conclave, celebrates art, culture and literature of the tribals. “I would like to think of Tata Literature Live as one more expression of the same, because literature, theatre, poetry and art are very important in fashioning the way a society thinks,” says Bhat. The group also sponsors the UK’s largest literary festival, The Hay Festival of Literature and Arts. “It helps us to contribute differently to the community from the contributions we make to the industry through products and services,” he says. For its sesquicentennial year, Tata Group wants to reignite the pride in the group and the brand among all its stakeholders, starting with employees. It launched a special logo to mark the year with guidelines on how the logo was going to go on to various touch points of the companies. Tata Consulting Engineers has created anthems around the logo, and other group companies have launched limited edition products to mark the year. The first limited edition product was by Tata Tea, called Tata Tea 1868, which was unveiled at the World Economic Forum in Davos by Tata Group chairman N. Chandrasekaran. Titan has launched a special edition watch to celebrate the 150th year. 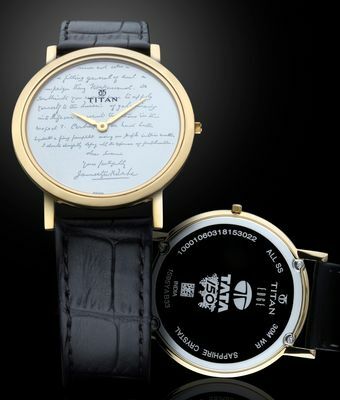 Its dial has been inspired by the letter Jamsetji Tata wrote to Swami Vivekananda during a voyage. Tata Starbucks’s coffee-based beverage, Tata 150, is another one. “Tata Motors also has one of their new designs being inspired by the 150th year,” says Bhat.